Without further ado, here's how much sock knitting a girl can get done in one day while studying, flying, and unpacking. Enough to make her proud but still leave her with some cold toes. 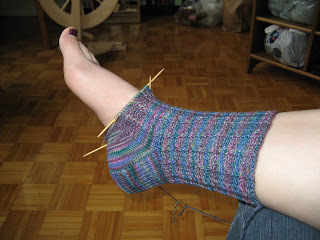 I'm hoping that I'll be able to get this sock finished before the end of the week so I can get started on its mate. The ultimate goal being to reduce the unwieldy collection of unused sock yarn in the stash (the opposite of what has actually been happening since my last update). I'm thinking that I might commit to finishing two pairs of socks per month. This works out to one sock per week. It's feasible but a little ambitious considering I keep getting distracted by things like this (a.k.a. my first real attempt at designing anything from scratch). 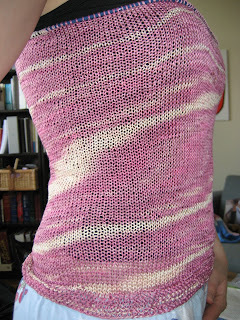 Ignoring the polar bear pyjama pants, this charming tube is aspiring to become a airy tank top of some description to be used for summer layering (obviously to be worn with actual pants). I've already frogged the armholes about three times and have revised the original fly-by-the-seat-of-my-pants design strategy as a result. The original plan was to do a simple boat neck that would allow the silk to drape a little and add interest to the neck. Looking at this picture though, I'm tempted to plan in a V-neck instead. Any thoughts? 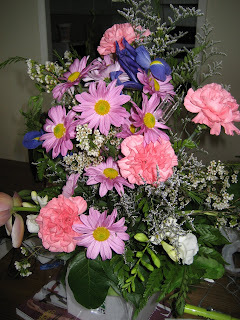 And on an unrelated note, I thought that I'd share some beautiful flowers that my mom sent to congratulate me for finding my first career-type job. They definitely help brighten the otherwise dreary weather we've been having as of late and remind me that summer's just around the corner. Posted by Amanda at 4:14 p.m.
May 16, 2007 at 6:09 p.m. I think you got a few rows further than I did on my day. Love the top, I think a v-neck would be really flattering. May 16, 2007 at 7:10 p.m.
Hey, the colors in the knitted objects and the colors in the flowers match! Were you and your mom coordinating on purpose, or is it a happy accident? The top looks great. I think a v-neck would be flattering, but I have no idea how to design my own pattern so I'll leave the decisions to you. May 21, 2007 at 3:11 p.m.
May 22, 2007 at 8:06 p.m.
May 23, 2007 at 2:23 p.m.